This work should be preceded by two things. First, students should have an opportunity to explore electric forces on a macroscopic scale by using pieces of plastic that obtain an electric charge when rubbed. Second, students should be introduced to the main concepts in the text below in a lecture-style or class discussion format. Most importantly, they should be shown a full table of the isotopes: one is available from Wikipedia. Electro-magnetism is more complicated than gravity. We will concentrate on just the electric part of this force. Electric forces are much stronger and more versatile force than gravity. For example, the force of gravity between two protons in the nucleus of an atom is about 1 × 1036 times weaker than the electric force between the same two protons. All of the known isotopes of all of the elements can be shown in a table of isotopes, as your teacher has already shown you. In the graph shown at left all of the isotopes are depicted as small squares placed to show the number of protons (x-axis) and neutrons (y-axis) in each one. There is a line on the graph showing the places on the graph where the number of neutrons equals the number of protons (n0 = p+ or N = Z). Notice that the elements from hydrogen (Z = 1) to calcium (Z = 20) have their stable isotopes (the filled-in squares) on the line of n0 = p+. These isotopes have a n0/p+ ratio of 1 (or very nearly 1). Isotopes to the left and right of the line do not have a 1/1 ratio of n0/p+ and are unstable (radioactive). As you look at elements with a higher and higher Z (more and more protons in the nucleus) you should see that the n0/p+ ratio for the stable isotopes gets larger. Eventually, near the top of the graph, there are no more stable isotopes. Essentially, this means that no matter how many neutrons you add to atoms of these elements you cannot find a completly stable ratio of n0/p+. Unstable isotopes decay by breaking up or by emitting particles or energy. Most of the unstable isotopes on this graph only exist when they are manufactured in a lab (the empty squares). These radioisotopes decay so rapidly that if they are made by natural processes they are not observed because they have already transmuted into other isotopes by the time scientists come across them. Even though the n0/p+ ratio of some isotopes is not ideal they occur in nature (the squares with dots). These naturally occurring radioisotopes are unstable but do not decay too rapidly and so can be mined from minerals on Earth. Examples include 40K, 48Ca, 235U, and 238U. What does the x-axis of this graph show? The y-axis? What do the little dots on this graph represent? What does A - Z equal? What does it mean on this graph? What does Z = A - Z mean? What does it mean on this graph? What do the numbers next to horizontal lines mean (2, 8, 20, 28, 50, 82, 126)? What do the numbers above vertical lines mean? Why are there only dots on part of the graph of Z vs. A – Z? In other words, why are the possible isotopes limited to that narrow curved patch on the graph? Up to a certain point the path of the possible isotopes on the graph follows the line of Z = A – Z. Then it curves upward showing more and more neutrons per proton. Explain why this happens in terms of what you have learned about the fundamental forces important in the stability of an atomic nucleus. element 4, Z = 25, Zr, element 79, and lead. No elements above Z = 83 have any stable isotopes. Why do you think that is? Look at the numbers and lines that are written on the graph (2, 8, 20, etc.). Up to 20 the the lines meet in the same place. After that they are increasingly far apart. In terms of the stability of atomic nuclei describe and explain the pattern that you see. Stable isotopes have a dark grey background. The table above is a close-up of part of the table of isotopes. 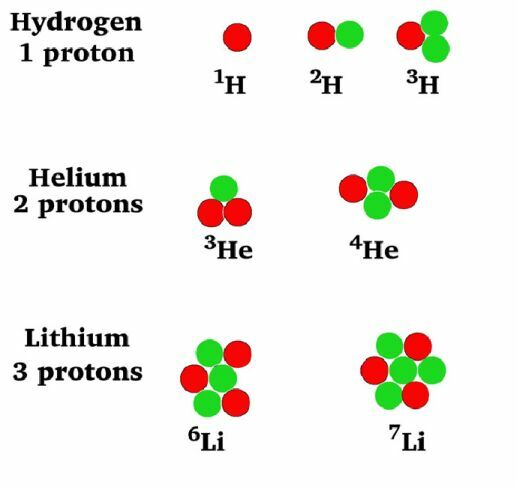 How many isotopes of hydrogen are there? Which ones are stable? Write both the name and the symbol for each isotope of hydrogen. How many isotopes of carbon are there? Which ones are stable? Write both the name and the symbol for each isotope of carbon. Make a chart on a separate piece of paper with the headings shown below. Include in your chart all of the isotopes shown in the table at the top of this page. When you calculate the n0/p+ ratio divide the no. of n0 by the no. of p+ and record the result as a decimal to three places. When you finish this task make a small version of the Z vs. A - Z graph on graph paper: record the number of protons and neutrons for each isotope as a dot. Draw a line on this graph for the places where Z = A - Z. What ratio corresponds to the largest number of stable isotopes? Explain what makes nuclei unstable when they have a n0/p+ ratio greater than the stable ratio. Explain what makes nuclei unstable when they have a n0/p+ ratio less than the stable ratio. Using the information in the table at the top of the next page make another chart on a separate piece of paper or add to your existing chart. Use the same headings as before. Record the relevant data for the isotopes inside the space defined by corners at Pt-196 and Tl-210 at the top and Rn-204 and Rn-215 at the bottom. Make a new graph of Z vs. A – Z, being sure to leave room to draw in a line for where the number of protons equals the number of neutrons. What is different about these isotopes as compared with the isotopes you charted from the beginning of the periodic table? What is the most common (or average) stable ratio of n0/p+ here? How does it compare with the stable ratio for isotopes near the beginning of the periodic table? That is, why is it different? Why are there fewer stable isotopes in this part of the periodic table (Z = 76 to Z = 92)? Do you think that there will be any new element with Z > 83 discovered that have stable or long-lived isotopes? Why or why not?